Nihilism is often defined as believing in nothing, having no purpose or loyalties and no true beliefs. For Nietzsche, who is most commonly identified with it, nihilism is the realization of the extreme subjectivity of the human existence. By this philosophy, all of the structures and beliefs we are raised with are just imposed upon us, not objective realities. In the twentieth century, nihilism is most commonly of the existential type, that is, the belief that life is purposeless and meaningless. Existential nihilism may have been common among early pagans, but ever since the major religions took hold, life has always been thought by most to have a higher purpose: kindness to others, enlightenment, contemplation, even “making something” of ourselves. We may not think of ourselves as nihilists today: there are still a lot of people who believe in an afterlife to strive for, or the possibility of easing the burdens of others in this life. But there is a steadily growing cynicism the Western world that approaches the limit of what humans can take and still have any hope for the future. One of the less common definitions of nihilism is, in fact, extreme skepticism. In some ways, this is just hipster culture writ large. Unlike Gen Xers, many of whom found ways to express anticapitalist sentiment through subculture, Gen Y has nowhere to run or hide. All forms of cultural rebellion have long since been appropriated and integrated into the ideology of capital. Marketing firms and advertising agencies now enjoy an unprecedented relationship with the avant-garde, so much so that they’ve become one and the same. By this logic, war protests are not unwelcome but expected as part of the success of a functioning democracy. Ad execs steal from hipsters in order to market jeans to their mothers. Even the existential nihilist is an identifiable brand, a beret-wearing, cigarette-smoking philosopher who takes his expected societal place even in the midst of his narrative of pointlessness. Is this not nihilism by abstraction, this sense that we are all players in someone else’s game, with our moves predetermined and ultimately ineffective? And, it seems, the only remedy is opting out – the coming barbarism of which the article speaks. It is the willing removal of oneself from any genuine commitments or passions. And it is terrifying. With no passion, no investment – and so on in a vicious cycle. Adbusters advocates political involvement as the solution, to “storm and occupy whatever political and economic space we can.” But I suspect this new meta-nihilism has spread to politics as well: how can one support a politician when in five years it is conceivable that he will have “crossed the floor” or possibly be found in hypocritical violation of every principle he espoused? (Former Representative Mark Foley, anyone?) Even Obama, who actually managed to turn the tide and reach those who traditionally wouldn’t care with his politics of audacious hope, seems to have let us down by not being the messiah he was purported to be. The disillusionment has spread, because if he can’t change Washington (or our world as we know it), stop climate change, end the wars, quiet radical Islam, and bridge all divides, then who can? It would be nihilism … with purpose. A new dark age indeed. Capital is not necessary for social organization – that is, we want things to be free. Today, everything from news to music to classified ad services has a new benchmark to attract our attention: no cost to us, and preferably none of those pesky ads, either. It is a race to the bargain basement, which Gen Y began, but which now encompasses everyone. Meanwhile, content providers are struggling to keep up (and many are not). And the “culture of free” has become an ideology. I’m going to make the bold statement that I don’t believe we are revolutionary for wanting to get things for free. This supposed worldview – that information should be accessible and open – was and is just a convenient position to hold right now. It is no coincidence that the noble championship of piracy arose when most of the members of Gen Y were teenagers, making them a) not yet old enough to be generating capital of their own and happy to get something for nothing; b) at the age when they wanted to “stick it to the man” (or however that sentiment is phrased now), especially the capitalist pigs who profited off their (parents’) hard-earned cash; and c) able to master new pirating technologies before anybody else could devise a clever way to stop them doing it. Piracy therefore developed so rapidly simply because there was an option. People figured out how to share music (and books, and movies, and opinions) in a new way, and so they did. It started with just ripping and burning, making mix CDs rather than mix tapes. Eventually P2P took off because it was offering a useful new service: downloading music directly to one’s computer. There was no legal competitor, so the free (not-yet-illegal-but-definitely-immoral) version took off. And now it is expected by all that the thieving will continue unabated. We are affronted when record labels attempt to regain their lost profits from hapless downloaders. We scorn those who prosecute the programmers at Pirate Bay. And we revel in the fact that blogs are thriving while subscription-fuelled media giants are hemorrhaging readers. Now, there is certainly something to the argument that the freer exchange of copyrighted materials that enables piracy can be a good thing. It exposes people to more music, and many people who “pirate” music get engaged then proceed to purchase more music or go to more concerts than they would otherwise. But I dispute the idea that the free stuff movement is anything more than a convenient justification of existing behaviour. Ideologies rarely stick solely because they are noble and altruistic. More often they are useful, and solve practical problems. The “free stuff” movement solved the problem of paying for copyright materials. History has seen many excellent, convincing justifications for getting something from nothing. Real pirates and thieves perfected the art of it, and were/are only stopped with effective policing (whether by international tribunals or the more traditional method of hanging). Aristocrats, priests, and the nobility for most of human existence claimed that they deserved by divine right to profit from their vassals’ labour. They were only coerced into some semblance of fairness by the threat or occurrence of violent uprisings. And communists claimed the right to free things with an ideology based on the natural inequalities between humans. From each according to his abilities, to each according to his needs, as Karl Marx wrote. But Communism has never really been successful because whenever some people are getting something for free (or with minimal labour), others are working hard and getting nothing. This is a fact that modern pirates inherently know: the record label executives and established acts are suffering, but so are the sound engineers and indie artists. So how did stealing from others turn into an altruistic ideology? [I]n communist society, where nobody has one exclusive sphere of activity but each can become accomplished in any branch he wishes, society regulates the general production and thus makes it possible for me to do one thing today and another tomorrow, to hunt in the morning, fish in the afternoon, rear cattle in the evening, criticise after dinner, just as I have a mind, without ever becoming hunter, fisherman, shepherd or critic. And yet the dabbling, for all its appeal, is why the “culture of free” is ultimately unsustainable. Humans want recognition as individuals, and Gen Y wants this more than anybody. But dabblers are rarely experts, and their output is rarely singled out for recognition. As Keen notes, the problem with the democratization of media is that it creates a situation in which everybody has an opinion but nobody has an audience. And no audience means no capital, which will become a problem when Gen Y moves out of their capitalist-pig-baby-boomer-parents’ houses and has to pay for their own internet connections. Humans feel national consciousness so deeply that in some cases the nation becomes an extension of ourselves. Gandhi once famously said of the post-independence partition of India and Pakistan that “before partitioning India, [his] body [would] have to be cut into two pieces.” The Economist recently described the German Federal Republic as a “matronly 60” and unification approaching a “post-adolescent 20.” And the “body politic” is a familiar concept to all of us. 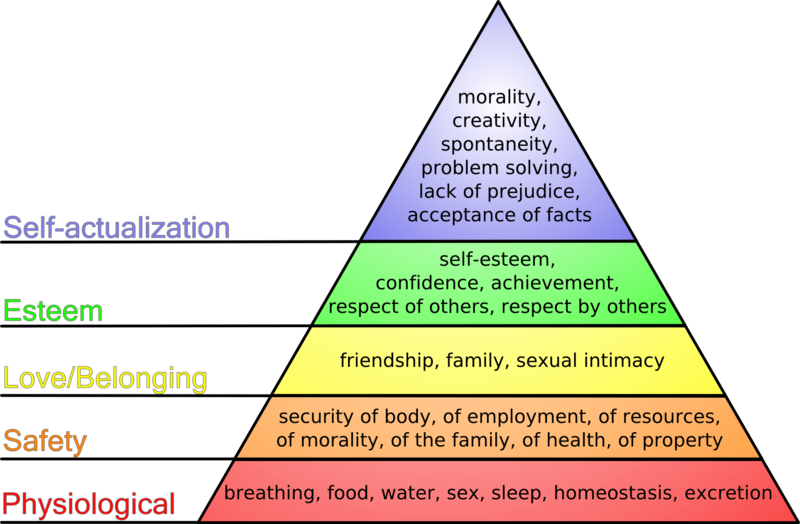 Maslow’s hierarchy charts the progression of human needs from basic physiological survival – breathing, eating, etc. – to the highest-order need of self-actualization, which involves acceptance of oneself as is, being all that one is capable of becoming, and living with internally-motivated purpose. Like Maslow’s personal needs hierarchy, the national one assumes that lower-level needs must be met before progressing to the next level. And like Maslow’s pyramid, the upward progression through the different kinds of needs is one from physical security/territorial necessities to more psychological or social ones. In both, the apex represents the fulfillment of potential and is the optimal state. The most basic national need is territorial integrity, through a defined physical space, and both de facto and de jure independence. It seems obvious that physical borders have a huge impact on the populations therein: they shift people’s movements into school districts, tax codes and trade permits, as well as, on a more general level, forcing them to go through particular national channels to conduct their daily business. They represent official languages and religions, laws and norms, war and peace. We often term nations that do not have this need satisfied “failed states”: failed, perhaps, because they cannot sustain any higher level without it. Next is a free government, and by that I really mean a functioning representative democracy. I debated whether or not to put democracy here, as there are certainly many examples of states in history and in the present day that seem to function on higher levels in some ways without fully democratic government. But I do think that in order to secure the kind of economic and cultural freedom of the higher levels that democracy is a must. The government must have fair laws enshrined in a constitution that are not easy to meddle with (there goes Italy, I suppose), and civil rights. Perhaps the majority of nations today haven’t passed this stage, especially without universal adult suffrage. The fourth is a thriving public sphere. Really this is the nation’s view of itself, through its political discussions, art, literature, and history. It is at this level that individuals really start to use the nation as a cultural touch point for identity, as I wrote about in an earlier post. This is where national pride comes from. An appropriate term for this is “imagined communities.” I have borrowed here from Benedict Anderson’s landmark book by the same name, which explores how nations are formed by citizens who “imagine” national political communities. These communities exist at a higher level than one-on-one interaction and as such are in the mind, which makes them a powerful force. I also wrote here of the concept of “loyal opposition,” which, from the British tradition, means a party or individual can disagree with the policies or ideas of the governing party but still respect the authority by which it is in power – an essential trait of a functioning democracy. Implicit in this is respect for the opinions/culture of others (which I sometimes fear is being lost in many political debates today). As with the personal model, progression through the needs is not always linear or complete. Nations may exist on several levels simultaneously (as people do), or may to fulfill higher-order needs without yet having satisfied lower-level ones. Would nineteenth-century Britain, which in many ways could be seen to have positive global influence and a set of national ideals, be considered a global leader? Certainly – yet this despite not having attained universal adult suffrage, or even peaceful relations with its neighbours. One might also point to “nations” that are not independent political entities, like Quebec, which have a defined culture separate from the rest of Canada. Interestingly, Gilles Duceppe, leader of the federal secessionist Bloc Quebecois, recently used his own corporal metaphor in referring to his party as a young twenty years old, a “nice age…Especially when compared to the Liberal and Conservative parties, which are 143 years old… When you’re 20, you have the energy to fight against the system, which in our case is the federal system.” But in response to Duceppe’s incendiary claim that Quebec separatists are akin to French Resistance fighters in WWII (! 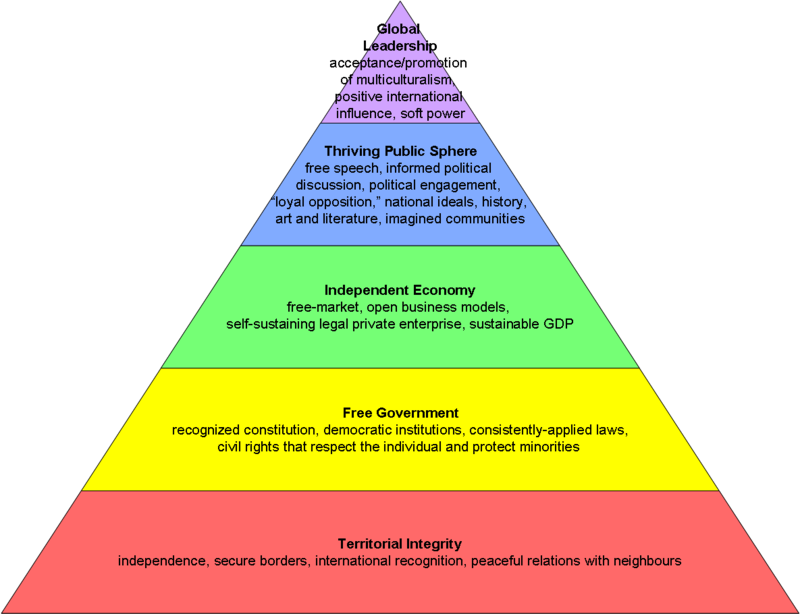 ), I would hold up a federally united Canada as an example of a self-actualized nation of imagined communities, at the top of the pyramid. Canada is strong and unique because of unity among its differences, linguistic, cultural, historical – whatever. It is the peaceful acceptance of dissenting and disparate views within (and without) that allows a nation to have such global influence. This is what separates Canada from, say, Iraq, and why it is one of the most common destinations for immigrants. But what do you think? Does the model make sense to you? Have I missed anything out? Is anything in the wrong place, in your opinion? Do you believe Canada and the United States are “self-actualized” nations? If not, why not? Shuffling Off Our Mortal Coils – Or Making Them Our Centres? These days we seem obsessed with our bodies: thinning them out, bulking them up, getting them into “shape,” perfecting their curves and improving their features, and generally doing all we can to modify or preserve our outer encasements. My body is my temple, as the saying goes. And I will worship it with margarine and Red Bull. The body today is seen as the beginning of life: we must treat it well in order to function well in other areas of existence. We must get a good breakfast with plenty of protein and fat (but only good fats!) to fire up our metabolism for the day. We are advised to consume more carbohydrates to get our brains in gear. Running will help us sleep better. Sleeping better will help us live longer. Living longer will give us more time to watch what we eat. I don’t disagree with any of the above advice, but I do wonder when our mortal coils became separate entities from our minds. In The Republic, Socrates notes that both music and gymnastic education contribute mostly toward forming the whole person (note that to him, music was more important). Physical activity, moreover, was meant mainly to avoid illness. Socrates points out (as is explored in this article) that the soul comes first, and produces a good body, and that a healthy intellect results in a healthy body. The mind is the primary concern, and the instigator of physicality. Perhaps the corporal obsession comes from our modern need for control. We don’t feel it anymore over our minds. We sense that life is one big game of Survivor with people out to outwit, outplay, and outlast us: advertisers trying to con us into buying more products we don’t need, politicians lying about what they’ll do if they are elected, even subliminal messages that influence how we think without our knowledge. But we can slim and sculpt and swap out bits of our physical exteriors that we don’t like. As Olivia Newton John would say, let’s get physical. Or perhaps it goes back further, to the late nineteenth-century fixation upon masculinity that took root in Western culture and never quite left. In the logic of British imperialism, for example, “masculine” traits like aggression, control, competition and power were all inherent qualities of a successful imperial people, in contrast to the primitive effeminacy and weakness that characterized the “lesser races” they sought to civilize. This hypermasculinity found its expression in an overt and growing militarism, spurred on by the imperialist canon of Robert Baden Powell and Rudyard Kipling, among others. Men delighted in proving themselves in war, perhaps an outlet of barbarism in their cloistered, prim, restrictive society. In this period, Teddy Roosevelt (my personal favourite president) advocated a “strenuous life” of strife and toil, as individuals and as a nation (in the form of imperialism), in order to “ultimately win the goal of true national greatness.” [Come to think of it, he may have been one of the founders of our modern bias toward action that I wrote about in an earlier post.] Individual strength, ruggedness, and power would lead to national victories, particularly in the imperialistic wars that were coming, in Europe and around the world. And they prepared for war with sport, and play. It’s no coincidence that the Olympics were revived in the middle of all of this imperial scrambling, in 1896. Though we have since created a story about how the games are rooted in friendly international competition, they were no doubt seen by many then as a proxy for battle. (Some modern commentaries on the national medal counts make this apparent even today.) And though Robert Baden-Powell’s Scouting for Boys launched a century of camping, orienteering, and general outdoorsy skills being taught to young men in Boy Scouts (hilariously anachronistic title notwithstanding), its origins were in a survival manual Baden-Powell had written for his fellow army men camped in India. It was adopted largely as preparation for future imperial warfare. Even today, we worship those whose bodies are their primary known attributes much more than those whose minds are – at least with our money. Consider how many more people know who David Beckham is than, say, Tom Standage, or how many more watch America’s Next Top Model than the Reach for the Top provincial finals. What do you think? Has the hypermasculine focus on physicality of the high imperial age stayed with us to the present day, or do we have a new ideal now? Do you think corporality is the primary way through which we understand and describe the world? Do you use your mind to serve your body, or vice versa? You are currently browsing the posthistorical by kathryn exon smith blog archives for April, 2010.